Italian noodle casserole is a healthier version of an old-fashioned baked Italian pasta recipe. You’re going to love this healthier update on an old school dish with creamy noodles, meaty sauce and bubbly cheese. Swap out the regular pasta for gluten free noodles and this Italian pasta bake recipe becomes is one of the best gluten free casserole recipes that I have ever made! Disclosures: Compensation was provided by Gallo Family Vineyards via Sunday Supper, LLC. The opinions expressed herein are those of the author, and are not indicative of the opinions or positions of Gallo Family Vineyards. There are affiliate links in this post, meaning that if you click and make a purchase, the cost to you is the same, but I will earn a small commission. A vintage recipe from an old fundraiser cookbook gets a modernized update with fresher and healthier ingredients. The traditional Italian Noodle Casserole layers of creamy egg noodles and meaty sauce all topped with cheddar cheese. Truthfully, nothing Italian about it. This version adds veggies in the form of sauteed zucchini, replaces the egg noodles with traditional or gluten free pasta, and swaps out the sour cream for a lighter but still creamy and tangy Greek yogurt. DIt keeps cheddar cheese in a nod to the old school, but I did add a sprinkle of Parmesan just for a little Italian flavor. Where did this recipe for Italian Noodle Casserole come from? My mother-in-law was a pretty busy woman when The Hubby was a kid. She had a husband in the Navy, so he was often away on a ship for six months at a time. The family usually lived wherever he was stationed, even when he was out at sea, so this often meant South Carolina or Florida, although sometimes she was back home in Pennsylvania. But this also meant a lot of moves. She had two sons that she was raising, and The Hubby and his brother are about the same number of years apart as my boys, so I know that in and of itself is enough to keep you busy pretty much all the time. She had an older son who was with them at times, but when he wasn’t, he was also back in Pennsylvania, along with her parents, sisters, and most of her family and friends. So several times a year the whole family had to pack into the car to make the trek north for a visit. She also was usually working, either as a cleaning lady, waitress, or whatever job she could find at the time. But they also didn’t have a lot of money, so she had a repertoire of fast and inexpensive meals to keep the family well fed. Back in the 70’s, you know what that meant – casseroles. At the risk of offending, I’m going to be honest – not my favorite thing. Obviously, they still conjure up memories of childhood comfort food for The Hubby, and she would sometimes make her Chicken Casserole or something like that when he would come to visit. Except now that she knows my tastes, she really doesn’t anymore. And I certainly haven’t been making them, so my poor Hubby has been missing out on some of the favorite flavors of his childhood. Several years ago she gave me a cookbook from her local VFW, and she had contributed her recipe for Italian Noodle Casserole. Well, I’ve been staring at this cookbook for years, knowing that a good wife would make it for her husband, but I just didn’t. Finally I decided it was time to put my own spin on it. 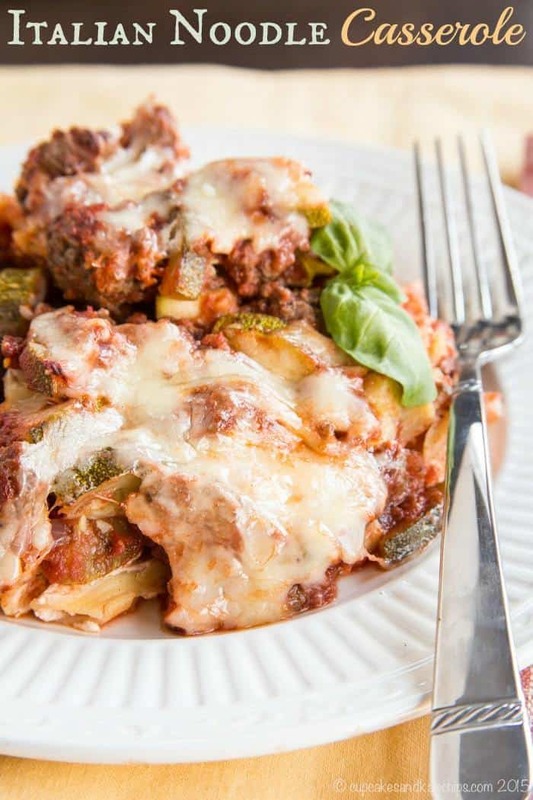 The cooked pasta gets mixed with Greek yogurt and cream cheese for a creamy base layer, which is topped with a mixture of browned ground beef, sauteed zucchini, and tomato sauce. A combination of cheddar cheese and parmesan cheese on top adds the perfect sharpness. Italian Noodle Casserole tastes like lasagna, but instead of hours of prep to make the World’s Best Lasagna, you can easily whip this up on a weeknight! Make it ahead and pop it in the oven right before dinner, or double the batch and freeze the leftoves (not recommended with gluten free pasta, though). This will feed a family of four to six, or you can serve it with an Italian-Style Wedge Salad or some Basic Roasted Cauliflower and feed more or have leftovers. 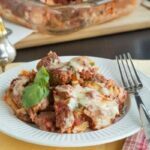 This pasta casserole recipe has a lot of meat and veggies, so it isn’t super carb heavy, and the creaminess of the pasta layer has a nice, smooth richness against the tomato sauce and beef. Add the sharpness of the cheeses on top, and you have a perfect combination of flavors and textures, and a totally satisfying meal the whole family will love. 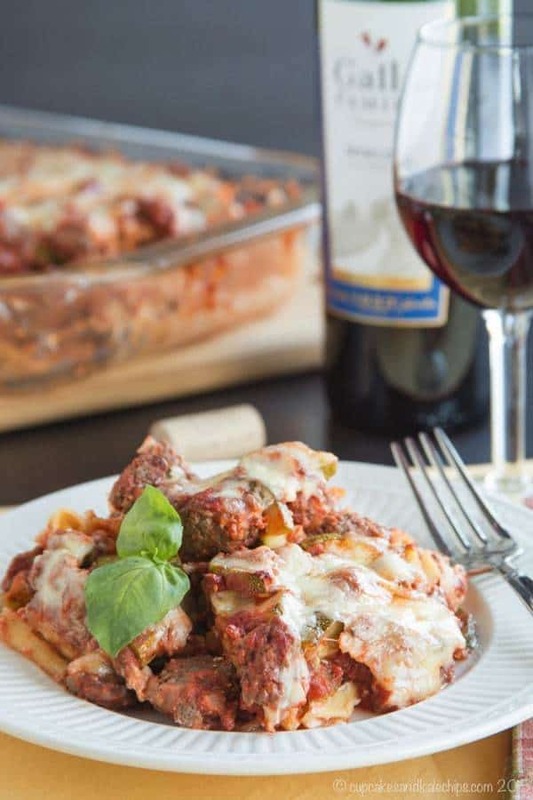 What wine should you pair with an Italian Pasta Bake recipe? Classic dishes call for classic wines, like Gallo Family Chardonnay and Merlot, which are always crowd-pleasers. 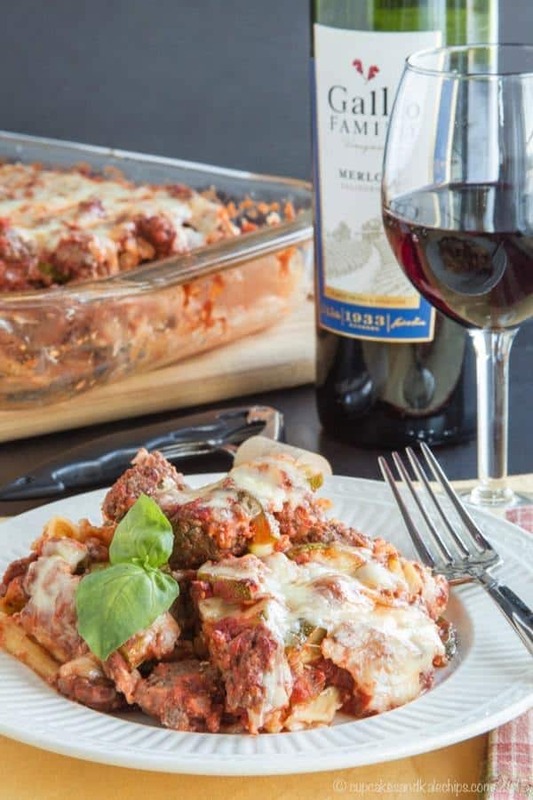 You really can’t go wrong pairing the full-bodied and versatile Merlot with a hearty pasta dish, which is what I chose to enjoy with this Italian Noodle Casserole. However, if you prefer a white wine, the creamy pasta does lend itself nicely to a Chardonnay. And since this Italian noodle casserole can feed a crowd, why not open a bottle of each and let everyone choose which they would prefer?! 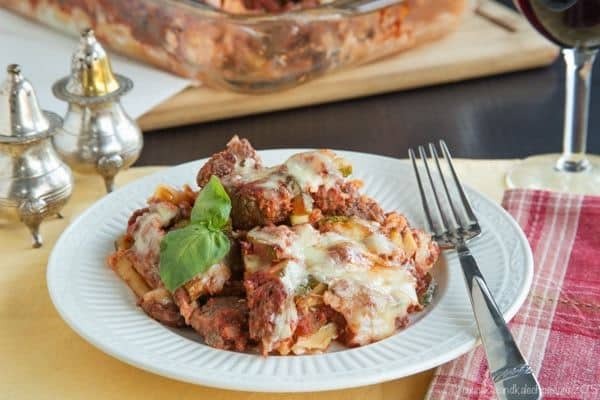 Eggplant Parmigiana Pasta Casserole has all the flavors of eggplant parm without all the work. 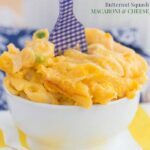 Butternut Squash Macaroni and Cheese adds some veggies to a favorite comfort food. Chicken Sausage Pumpkin Cream Sauce Baked Penne proves pumpkin isn’t just for pie. Kick things up with a Buffalo Chicken Pasta Bake from Inside BruCrew Life. Spinach Stuffed Pasta Shells from That Skinny Chick Can Bake are filled with ricotta, spinach, and mozzarella to make them so cheesy and comforting. And Chicken Spaghetti Casserole from RecipeGirl is a creamy dish the family will love. 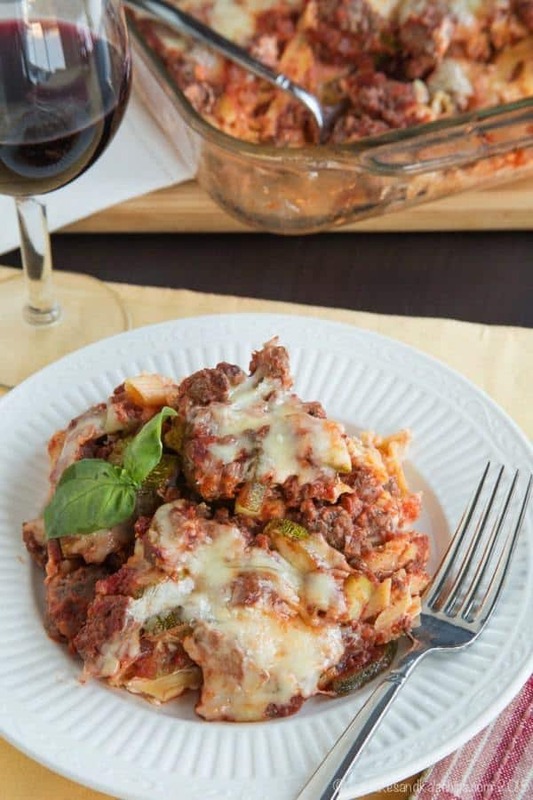 , and cook up this Italian noodle casserole recipe! Preheat your oven to 450°F and coat a 9x13 inch casserole dish or glass baking dish with oil or cooking spray. Prepare pasta according to package directions, cooking slightly al dente. Place a large skillet over medium heat, and add the ground beef, onion, and a pinch of salt and pepper. Brown the ground beef, breaking up while cooking, until nearly cooked through. Drain any excess grease. Add the zucchini and garlic to the beef and saute for about 5 minutes or until the zucchini is tender. Stir in the tomato sauce and Italian seasoning, and bring to a simmer. Season to taste with salt and pepper. After the pasta is cooked and drained, return the pasta to the pot or a bowl and stir in the Greek yogurt and cream cheese until smooth. Transfer the pasta mixture to the prepared casserole or baking dish. Top pasta with an even layer of the meat sauce mixture, the sprinkle with cheddar and parmesan cheese. Bake at 450°F for 15-20 minutes, or until heated through and cheese is melted and lightly browned. I just finished breakfast, but my mouth is watering looking at this fabulous cheesy casserole! Perfect comfort food that’s needed on this COLD April day! It is the perfect cold weather comfort food, Liz. Enjoy! I have this in the oven now and my kitchen smells heavenly. The addition of zucchini is brilliant. I went traditional with ricotta cheese but otherwise live this recipe as is. Thank you! Love your blog. Thank you, Bev. I hope you loved the casserole! This is making my stomach rumble, I am starving now!! My family would be all over this! Thanks for sharing. 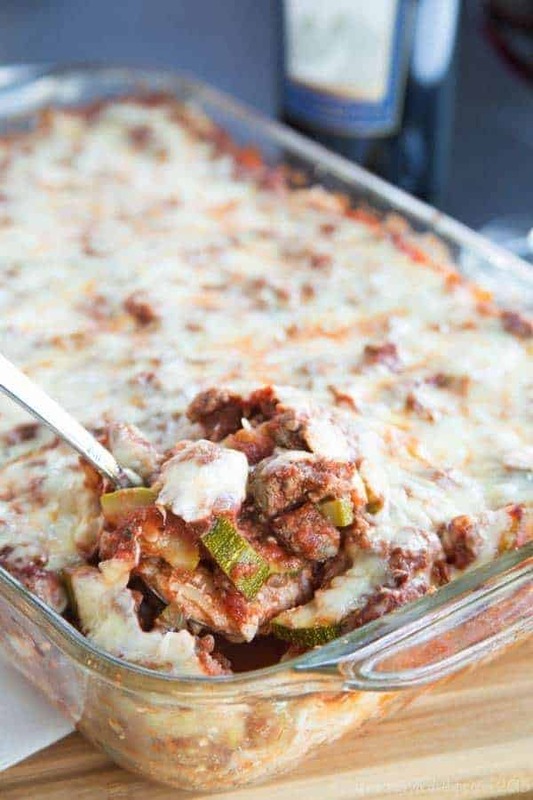 this casserole is total comfort food to this Italian gal! I’m a huge lover of casseroles (always have been), especially when they’re loaded with pasta. I’m glad you decided to go ahead with this recipe and that you enjoyed it. I know I would! Love the flavors! So healthy! This looks delicious! I love the creaminess added using Greek yogurt and light cream cheese. I’ve been drooling over this recipe all day. It looks amazing. My grandmother has a ton of recipes like this. I love that! Looks like true comfort food to me! YUM! What a great recipe! I love a good pasta dish and this one is a winner! We love casseroles and this one rocks! I love the addition of zucchini to this…and I’m glad this recipe brought a smile to your hubby’s face! 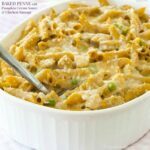 We are not big on casseroles either, but we do love pasta 🙂 This has so many wonderful flavors and I love how you added the zucchini – yummm. I like that, “classic meals call for classic wines”, so so true! This dish looks like the ultimate throwback meal, and I love that! It looks pretty tasty, too! Throwback with a modern twist, just what I like! This sounds like a winner, Brianne! Pure comfort food and perfect for a family meal!!! It really is, and even makes enough to have the extended family over! What a great pasta dish! I love the addition of veggies and using the yogurt.